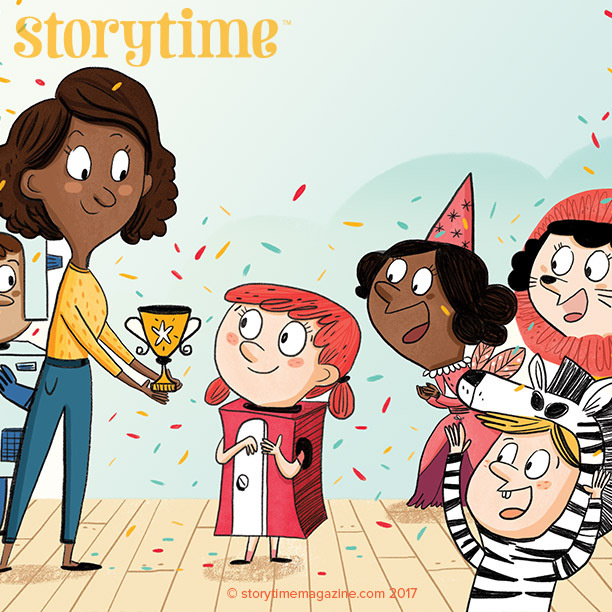 To celebrate our 50th Storytime issue, we’re not only running an awesome 50-Word Story writing competition for kids (find out more here), we’ve also put together a definitive guide, which reveals the ultimate library of 50 stories to read before you’re 10. The shortlist comprises folk tales, fairy tales, myths, legends, fables, and stories from around the world. We selected these 50 stories from over 350 tales we’ve published in Storytime in the last four years. They made the cut for a number of reasons. Some are classics or come with great moral lessons. Others are packed with subtle but clever devices that aid early literacy skills, such as repetition, rhythm, interesting vocabulary or inspiring characters. Several teach children about different cultures, and some are just funny. (Never underestimate the power of funny stories.) In short, they’re all fantastic stories – the kind you’ll remember and cherish forever. Our full guide is divided into different types of stories, from fairy tales to myths and legends, and comes with a brief explanation for why we’ve carefully considered and chosen each story. You can download it here. If you’ve missed any of these 50 stories in our Storytime issues, the list below shows you what issue they appeared in with a handy link to our Back Issue Shop. We hope you enjoy our selection and take on the challenge to read them to or with your child before they turn 10. Even better, ask them to read all 50 stories to you! Of course, we promise you many more fantastic stories to come. Bedtime stories, educational stories, cuddle-up stories, circle-time stories, stories to share with classmates and friends. Stories to make you think, help you escape, ignite your imagination, give you a new understanding of the world around you, empower you, enable you or change you. At Storytime, we believe that stories have that power. Make sure you download our full 50 Stories to Read Before You’re 10 pack and enjoy ticking them off as you read them. 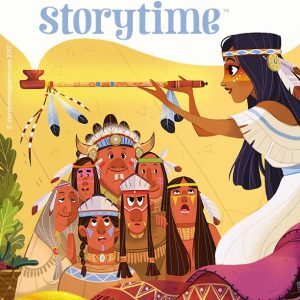 Storytime Issue 50 Is Out Now! This month we’re celebrating a landmark issue. Yes, we made it to the half-century! Storytime Issue 50 is out now and it’s a magical medley of stories and poems, just perfect for October. As you can see from above, we’ve got wizards, pumpkins, adventure and so much more. Plus to celebrate reaching this milestone issue, we’ve launched an amazing 50-word story competition for writers aged 3 to 9. The winner will have his or her story published in Storytime and bag a bundle of all 50 Storytime issues. 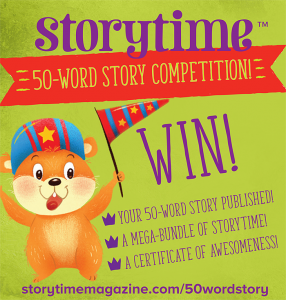 You can find out more about our 50-word story competition here. And make sure you download our pack. It has lots of activities to help you master writing super-short stories. It’s also perfect for use in the classroom or at home. For now, back to our 50th issue and the wonderful contributors who helped us create it. As ever, we are extremely grateful and eager to showcase their talents. Please check out their portfolios and heap them with praise. 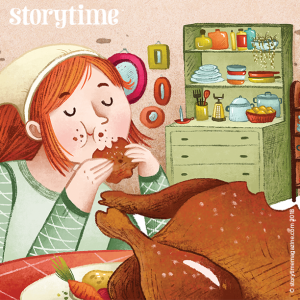 Here’s more about the stories we’ve conjured up for you in Storytime Issue 50. From Alphabet Boo ‚Äì¬†a Halloween poem illustrated by Tim Budgen in Storytime Issue 50. Our Storyland Adventures continue and, this month, everyone in Storyland is excited about Cinderella’s Pumpkin Party. It’s all set to be even better than the ball, until Fairy Godmother turns up with a bad cold. The incredible illustrations are by our regular contributor Giorgia Broseghini. If you haven’t downloaded our beautiful Storyland Adventures map yet, make sure you do. Storytime Issue 50’s Around the World Tale comes from faraway Papua New Guinea and explains the origins of morning dew. Tears of a Star is an origin story, which will make you look at dew differently. It’s illustrated by Astrid de Souris, who we’ve been lucky to work with before too. Jumping to present day, Team Small and Tall is a new story from writer Chris James. It’s set in school and features an exciting basketball game. It demonstrates how you can achieve anything if you work together as a team. Most importantly, it shows children that sometimes their weaknesses are actually their strengths. We think Serena Lombardo‘s energetic illustrations will make you smile. 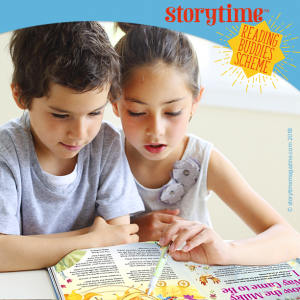 Our cover story in Storytime Issue 50 is The Sorcerer’s Apprentice. It’s a story that started life in Ancient Greece, but was popularised in a poem by Goethe in the late 18th century. There are versions of it all over the world, so its magic has spread far and wide. You might know it best as the Disney animation, Fantasia, starring Mickey Mouse. We hope you enjoy our version and are as captivated as we are by the illustrations by Marko Renko. Most fables focus on sharing morals about human behaviour. Rarely, they combine a moral with explaining how the world came to be as it is. Storytime Issue 50’s The Battle of the Birds and the Beasts does just that, delivered in a short but sweet package. Bat fans will find it interesting and kids will love Emma Levey‘s illustrations and spotting all the animals. Diwali celebrations are almost upon us and Indian legend Rama and Sita is one of the great stories to share at this time of year. With a spectacular baddie, an epic adventure and a candlelit ending, it’s a story that transcends cultures and has wide appeal. School subscribers can download our free teaching resource pack to accompany this story. Find out more at Storytime for Schools. Bhumika Jangid from India provided the stunning illustrations for this story. Finally, we close the issue with The Pied Piper of Hamelin. It’s a story that some might hesitate to share, remembering darker versions from the past. Yes, the Pied Piper is an odd fellow, but it’s the town’s mayor who’s the real villain in this story. Plus, it’s refreshing that the heroine is a child who is able to be heroic because of her hearing impairment. All in all, it’s a great story and we hope you like our friendlier version. It comes with lovely illustrations by Benedetta Capriotti. 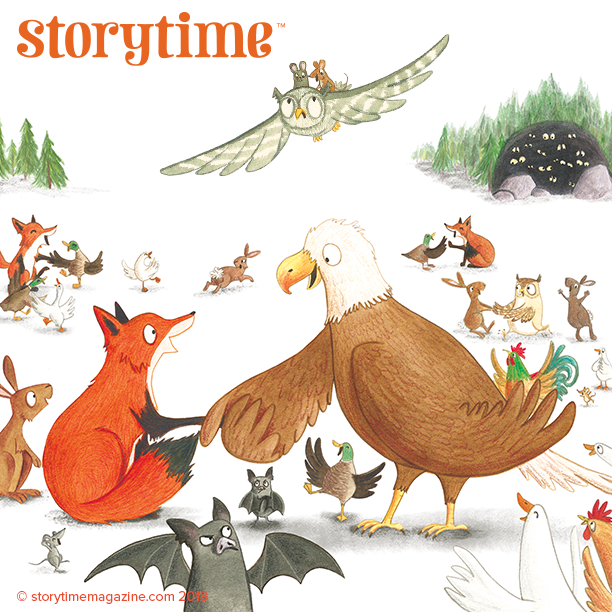 As you can see Storytime Issue 50 is jam-packed with stories and a poem, as well as activities, book recommendations and our 50-word story competition! You definitely don’t want to miss it – and we can’t wait to see your competition entries. Be sure to pop back here in the next few weeks, as we have lots of great content coming up, including 50 Stories to Read Before You’re 10 and an interview with our cover illustrator, Marko Renko. Here’s to another 50 issues! One reason stories are so special is because they can address tricky subjects, from moral dilemmas to more serious life challenges, in a creative and ‘cushioned’ way. This is true for adults and children, but there are many powerful stories to help school children in particular. 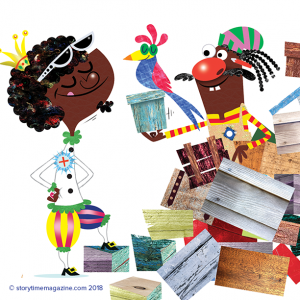 Mo and the Jumping Jelly – Sara Osman’s Tale from Today in Storytime Issue 49 – addresses an issue that might seem trifling but can be a big deal when you’re starting school. We’re talking school dinners. An unfamiliar system with queues and choices and people you don’t know! Strange foods you’ve never tasted before! Table manners! To some school starters, lunchtime can be daunting and can cause a lot of stress and tears. Some children are so petrified by it, they insist on packed lunches, and we know that some refuse to eat at all. We’ve had a lot of positive comments from parents about this story and we’re happy that it has been helpful. This inspired us to pull together a selection of stories to help school children and parents face other dilemmas. Dip in and out as and when you need them! Different is good in Eszter Molnar’s Pencil Sharpener story for Storytime Issue 35. Art by Jess Pauwels. 1. For children who worry about being different. Different is good and there’s no better story to get this across than the lovely I Want to Be a Pencil Sharpener by Eszter Molnar in Storytime Issue 35. It’s school dress-up day, and Daisy’s refusal to conform is initially met with dissent by her classmates – but not for long! 2. For children who don’t like working as a team. There’s a lot of teamwork in school, and that can cause frustration, but it can also lead to huge triumphs. There are two great stories you can share with your children to express the advantages of learning to work as a team. The fable, The Four Harmonious Animals, which we published in Storytime Issue 4, and the enduring classic, The Enormous Turnip, which appeared in Storytime Issue 29. We have another great teamwork story coming up in Storytime Issue 50 called Team Small and Tall, so keep an eye out for that too. 3. For children who lack confidence in their own abilities. In Storytime Issue 37′s story Miss Beck’s Spectacular Specs by Amanda Brandon, the tables are turned. It’s a teacher who relies on the help and ingenuity of her class to get her out of a scrape. Children have amazing minds and this story will help assure them of that fact. 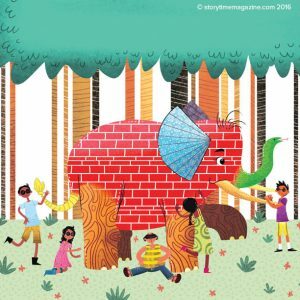 The Blind Friends and the Elephant – the perfect story for building empathy in Storytime Issue 16 – with art by Alice Brereton. 4. For children who refuse to see anyone else’s point of view. Trying to see arguments from other perspectives is a big learning curve for children. It’s one they’re thrown into as soon as they start school, when they encounter children from different backgrounds and beliefs. However, it’s a key life skill and one of the main building blocks of empathy. For a story that sums up the value of sharing other peoples’ perspectives, you can’t beat The Blind Friends and the Elephant. 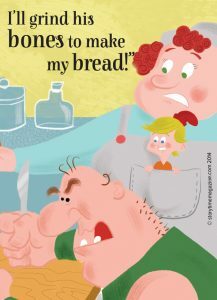 It’s a fable from Storytime Issue 16 and it’s pretty funny too. 5. For children who hate homework. Homework is tough when you’re little. With SATs, it only gets more intense as you move up through school. How do you encourage your child to keep at it even when they’re tired or bored? Try reading The Little Red Hen from Storytime Issue 47 or The Ant and the Grasshopper from Storytime Issue 8. Both feature main characters who put in the work even when they’d rather have help or do nothing. Both characters reap the rewards at the end and get results that make them feel proud. 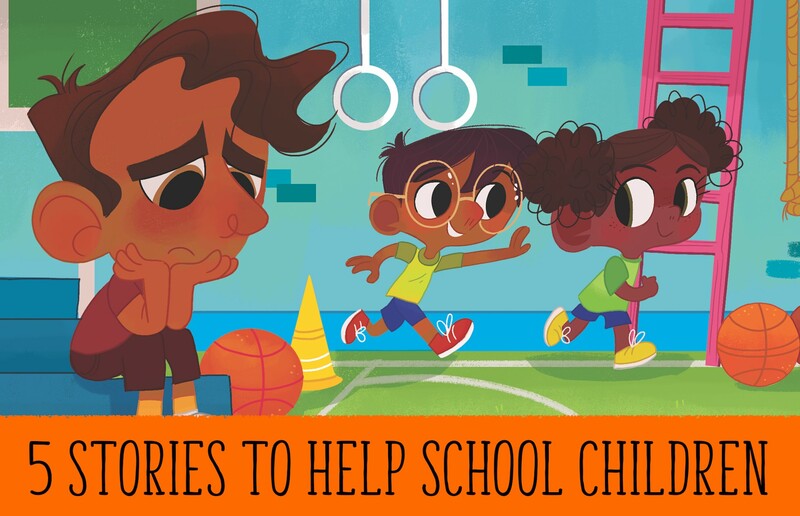 Hopefully, these stories can help make your life a little easier and be helpful to children too. Sometimes, when nagging or constant reassuring doesn’t work, deploying a story can be just the thing you need. We’ll definitely include more stories to help school children in future issues. If you have any thoughts on dilemmas we can address, let us know via Twitter, Facebook or Instagram. It’s short enough to memorise, therefore it’s great to learn off by heart at home and in school. It succinctly describes how cats behave at night. The poem features repetition, and we know that kids love repetition (read more about that here). We knew it would inspire a fabulous illustration and it has! 1.Swap the repeated line “The everlasting cat” with one that reflects the personality of your own animal. 2.Use a great simile to describe the way your animal moves or behaves. 3.Think up two lines to describe what the animal does well. How does the feel of the poem and how do the words change if you write about a fish, a bird or a snake? 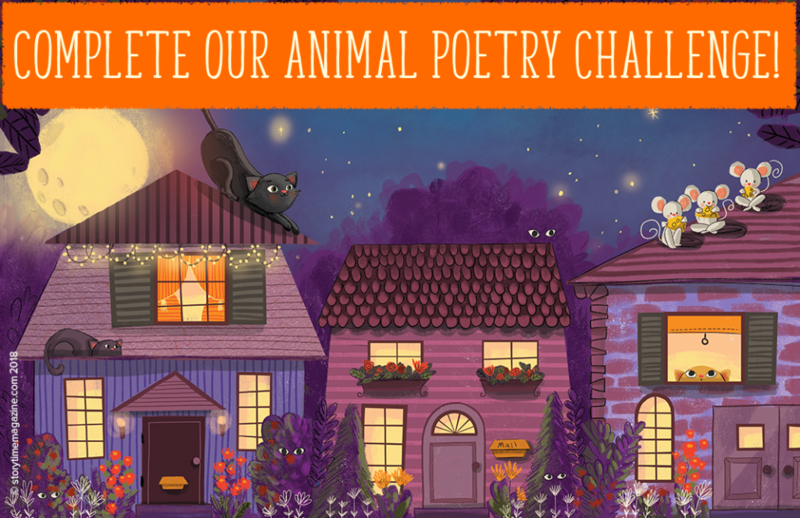 Use our Poetry Writing Pack to complete our Animal Poetry Challenge! This week, have a go at writing your own Brighty Rands-inspired animal poems at home or in school. Download our Poetry Sheet to write on. Alternatively, check out our full Poetry Writing Pack on our Schools site for more guidance and loads of great tips on how to get started with writing poetry. With National Poetry Day on October 4th, now is the perfect time for children to give our animal poetry challenge a go! 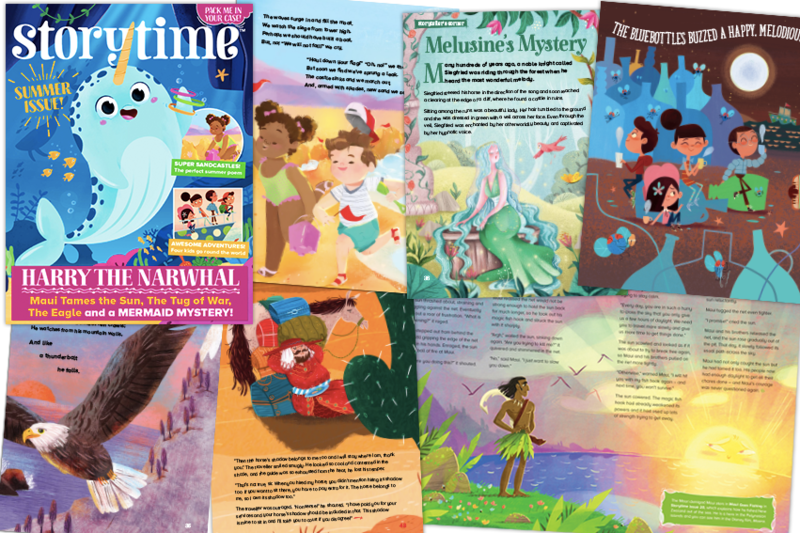 We’d love to see how you do, so please share them with us on Twitter, Facebook or Instagram – or drop us a line at hello@storytimemagazine.com and we’ll share the best! Reading Buddies with Storytime – Join the Fun! Today, we’re excited to launch our Storytime Reading Buddies Scheme, which is free to schools everywhere and you can get it here. What is a reading buddy? A reading buddy is quite simply someone who will sit and read to a child who isn’t quite ready for reading alone – a reading mentor, if you like. The child could be an an early reader or struggling with reading or daunted by it. Let’s face it, nobody is born with the ability to read.Without a reading buddy in some form, mastering letters, sounds, words and sentence structures would have been so much harder to achieve. Having a reading buddy is a huge boon to reading success. In fact, there’s solid research to support the idea that peer-to-peer reading (i.e. reading buddies) among school pupils is especially effective. In our Storytime Reading Buddies Scheme pack, the focus is on encouraging older pupils to read to younger pupils in a school setting. However, it has applications beyond school. There’s no reason why you can’t use it at home too, for instance. Our pack has been developed with valuable input from headteachers and KS1 and KS2 English leads. It can be used with your Storytime magazine collection or books. Alternatively, use whatever reading material you think is best to engage an early, reluctant or struggling reader. 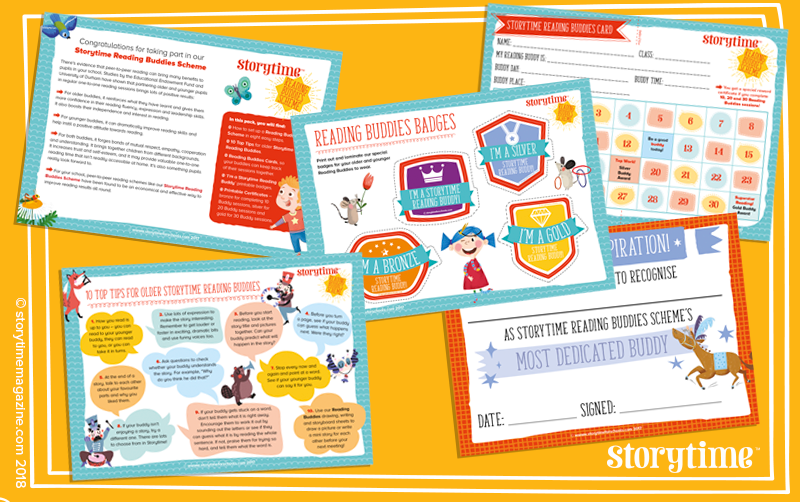 The pack comes with tips for setting up a Reading Buddies Scheme (for both teachers and older pupils), as well as printable progress cards, badges and certificates. Plus activities for the end of each session. And it’s all completely free! The benefits of paired or peer-to-peer reading are wide-ranging and long-lasting – and sometimes unexpected in a positive way. To find out exactly how Storytime Reading Buddies Scheme can have a positive impact on young readers in your school or at home, nip over to our Storytime for Schools website to find out more. For more ideas on spicing up reading sessions at school or home, also check out 5 Reading Styles That Really Work and discover how to get the best from Shared Reading too. Make sure you buddy up with someone this week! 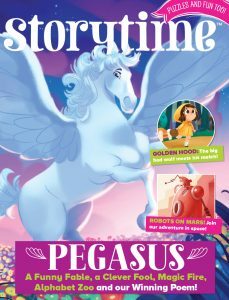 The highlight of our latest issue (Storytime 49) is a brand new story series called Storyland Adventures. It’s set in a fictional world and stars everyone’s favourite fairy-tale characters – from Puss in Boots and the Gingerbread Man to Goldilocks and Jack and the Beanstalk. Developing a whole new world like this is fairly mind-boggling and time-consuming, so it was a blessing that we had a clear idea of which illustrator we wanted to bring it to life from the start: Giorgia Broseghini. It was a huge cause for celebration when she agreed to come on board. We first worked with super-talented Giorgia on the Native American legend, White Buffalo Calf Woman, in Storytime Issue 34. We were so blown away by her beautiful depiction of the characters and use of colours, we couldn’t wait to work with her again. Luckily, We were able to do so on last year’s gorgeous Christmas issue (Storytime 40), when Giorgia provided the cover and illustrations for Clement Clarke Moore’s classic poem, A Visit from St Nicholas. Now she’s taking on the challenge of monthly illustrations for our new fairy-tale world, which puts famous faces in entirely different situations. Giorgia even created a beautiful map of Storyland for us (see below). You just can’t beat stories that come with a map to pore over! We really hope you are enjoying the first story, featuring Goldilocks and the Three Bears. There’s also a whole cast of supporting characters including Hansel, Tweedledum and Tweedledee and the Big Bad Wolf. We caught up with Giorgia to find out more about her career so far and her inspirations. 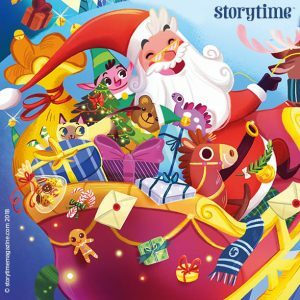 Santa’s on his way in Storytime 40’s A Visit from St Nicholas, illustrated by Giorgia. 1. How did you get started in illustration? For as long as I can remember I’ve always been drawing: on the couch, on the carpet, on the bus, at school, at home, at the restaurant. One of my most vivid memories is watching an old lady painting flowers. I was on vacation with my family and every night she was standing there. I could watch her for hours. Most of my birthday gifts were related to art and my favourite was the coloured pencils I got for Christmas. They became my favourite tool to draw. But I didn’t know what illustration was and even though I was passionate about art, I didn’t pursue it until after my bachelor degree in philosophy. I didn’t believe drawing could be a job! One summer I found a digital art school named Nemo, based in Florence, with a very professional program. I still can’t believe I talked my parents into it, but I am grateful I succeeded! It was a life-changing experience. I learned a lot about the illustration world – about techniques, composition, tools, illustrators – and I had the honour to learn from the best. Also, I met super-arty and nerdy people, and I lived in one of the most beautiful Italian towns. I’ve been working as an illustrator for four years. Even though it was hard at the beginning, I’m glad I never gave up. 2. What or who is your biggest inspiration? Disney, anime and movies have a great impact to my style. I love artists like Klimt and Mucha – decorative styles have always been my favourite. I really like illustrators and artists that play with soft and clear shapes. But it is very hard to say which one is my favourite, since I go through different phases. Every day I find a new illustrator or artist I love. The list could go on forever. I can name a few such as Norman Rockwell, Loish, Julia Sarda, Annette Marnat, Brittney Lee, Lorena Alvarez Gomez (who illustrated our Storytime Issue 15 Christmas cover and story – Ed), Glen Keane and Carter Goodrich. Studying character design, I also got used to observing real life, people, situations and colours. When I don’t know what to draw, I just rely on nature and funny people. 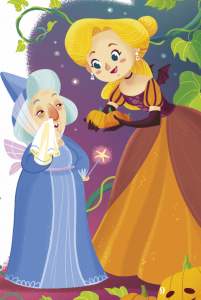 A sneak peek of Cinderella and the Fairy Godmother, coming up in Storytime Issue 50. 3. What has been your process for creating new versions of the famous fairy-tale characters in Storyland Adventures? Every time I have to create a new character, I start with research. I spend a lot of time on Pinterest trying to understand what a character looks like to other artists, and what he or she could wear. I look for outfits and hairstyles, colour palettes and moods. This helps me collect ideas. Then comes my favourite part: the sketch phase. Even though digital painting is my favourite tool, I love sketching. I feel free to try a lot of different characters and I can do it wherever I like. Always, I keep drawing and trying (maybe sipping a milkshake or a coffee in my fave café) and every sketch has something new. Sometimes it takes a while to find my character. 4. How do you stay on top of your busy workload? Do you have any top tips for illustrators on staying creative, inspired and on schedule? I keep a monthly paper calendar (that I draw on) and a list of the things I have to do. Writing it down instead of using devices is more helpful, at least for me. The exercise of writing helps me focus. I write everything in pencil and move things around when needed, and I tend to separate days into mornings, afternoons and evenings. I fill my little square boxes with goals, which I love to highlight with a bright colour once they’re done. When I have lots of projects I also force myself to wake up really early, and I plan my breaks and stick to them. I have my rituals, such as going out for a coffee after lunch or taking a walk, and I don’t give them up. I think it is very important, even when you’re stressed and a deadline looks like a hungry bad wolf, not to give up breaks (especially if you have to work 10/12 hours a day – a 20-minute nap is precious). These little tricks help me through. And if I am struggling with creativity, I go back to my sketchbook and try to find the joy of drawing again. It is normal to have hard times now and then – a job is a job. It isn’t always easy to stay focused, inspired and excited, but everyone has to find their own way to deal with those moments. An image from The Three Little Pigs, illustrated by Giorgia for Piemme, Mondadori. 5. Are there any favourite or interesting projects you’ve worked on that you can tell us about? Well, the project with Storytime magazine is one of the most interesting I have had the pleasure to work on. I can’t wait to see what will come next. 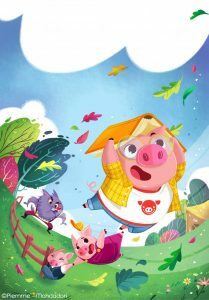 Another awesome project I illustrated this year is a new version of the Three Little Pigs for Edizioni Piemme, Mondadori (fairy tales, twist and turns: lovely!). I loved that project because I loved how I felt when I was drawing it! Fairy tales makes my imagination fly and I felt incredibly free drawing it. Every page was a surprise and a joy. 6. What would be your dream subject to illustrate and why? 7. So, is The Little Mermaid your favourite fairy-tale character? Giorgia’s amazing Storyland map for Storytime Issue 49. See the full map with key in the issue! 8. Is there any advice you can give to aspiring illustrators, young and old? Just draw, be patient and be curious about things. Let yourself be amazed by things even when others think it is stupid or childish. Be humble and accept advice, but also be proud of your work and your improvements. If you’re passionate enough and if you study hard enough, you can draw. Someone might say that you have talent, but talent is like a flower – it blossoms and lives if you take care of it. We’re loving the top tips for creative organisation, especially being strict about taking breaks – though we’re absolutely dreadful at following this advice, so promise to try harder in future. 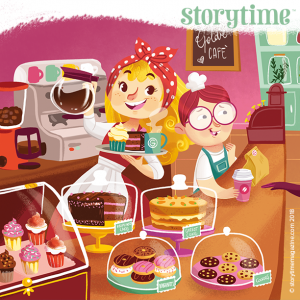 Make sure you check out Giorgia’s portfolio on Behance and Facebook, and don’t miss her work in Storytime. In coming months, you have much to look forward to, including Cinderella’s Pumpkin Party, Jack and the Beanstalk’s rock band, Gingerbread Man on a mission for Santa, and Puss in Boots meeting a scary troll! First things first, let’s celebrate reaching our fourth birthday, which is no mean feat for a small, independent publisher. We decided to mark the occasion with a new story strand. One that would fulfil our readers’ desire to see more of their favourite fairy-tale characters, but would also be fun for young readers. We hope it will help make the transition into the school routine and regular reading a little easier and more enjoyable too. 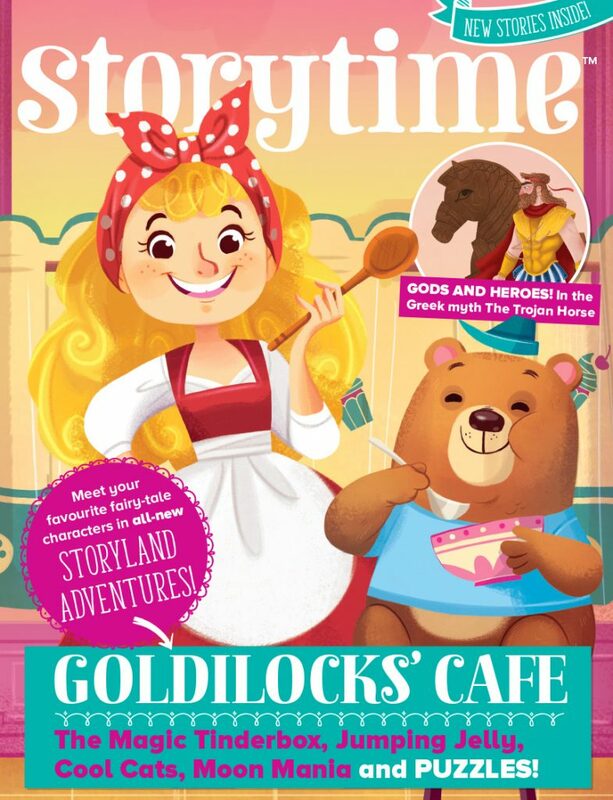 Goldilocks opens her new caf√© in Storytime Issue 49, with a little help from Hansel. Art by Giorgia Broseghini. Our new story series is called Storyland Adventures and is set in a magical, fictional world inhabited by all your favourite heroes, heroines and animals. Think Puss in Boots, the Gingerbread Man, Jack, Cinderella and many more! It opens with a story featuring Goldilocks and the Three Bears. They meet at the opening of Goldilocks’ brand new café, and it’s the first time they’ve seen each other since she sneaked into their house and caused havoc. 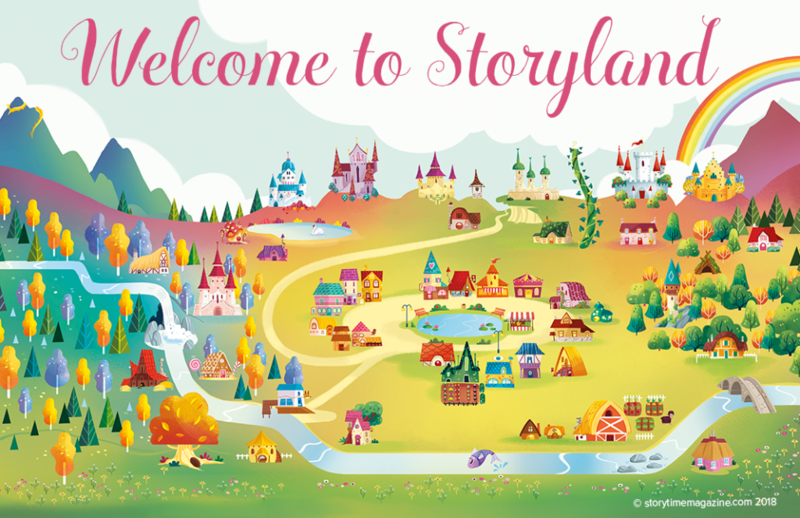 We’re extremely fortunate to be working with illustrator Giorgia Broseghini to develop Storyland’s huge cast of characters and she has even created a stunning map of Storyland. You can admire it here and see it in full in our issue too. 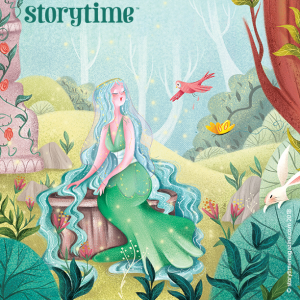 We hope you like her cover for Storytime Issue 49 and enjoy getting fully immersed in Storyland in coming issues. There’s a lot to look forward to. As with all Storytime issues, there’s so much more inside our latest magazine. We take a closer look at our other stories and contributors here. The King and the Moon ‚Äì an Around the World Tale illustrated by Gary Boller. We kick off with a story from the Dominican Republic called The King and the Moon, which Gary Boller illustrated with great humour. What’s interesting about this tale from the Dominican Republic is that it has never had a king, yet it produced this fantastically funny story about a king who thinks he can have it all. Even the moon. Cat lovers will appreciate our poem, The Cat of Cats by William Brighty Rands. It’s an ode to night-stalking felines everywhere. Our illustration with a built-in picture puzzle is by all-round cool cat MacKenzie Haley. For fans of our Myths and Legends section, we have a Greek classic – The Trojan Horse. School teachers, make sure you download and use our Trojan Horse Resource Pack, which is free for all school subscribers. 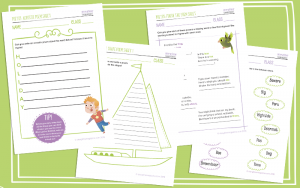 It comes with loads of lesson ideas and themed activities. Find out more at our Schools website. Valeria Abatzoglu provides the awesome illustrations for this myth. 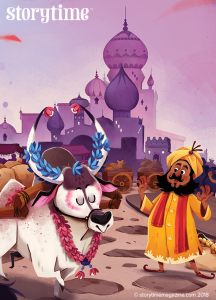 Buddha appears as Delightful the Bull in Storytime Issue 49, illustrated by Valeria Abatzoglu. Our Famous Fable is from India, starring Buddha in the guise of Delightful the Bull. There’s a lovely moral about treating others with respect and we’re so pleased with the illustrations by Raitan Ohi. School dinners can be a huge hurdle for young children, so we commissioned our Tale from Today with this in mind. Hopefully, Mo and the Jumping Jelly by Sara Osman will help readers who are struggling with eating in the school canteen (and their parents too). 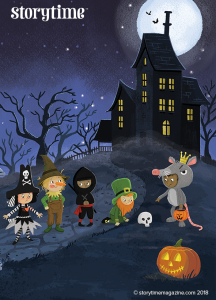 It is expertly illustrated by Gaby Zermeno, who previously illustrated our Pumpkin Jack poem in Storytime Issue 14. You can pick up this issue from our shop. Laura Wood’s illustration for The Clever Cook ‚Äì a funny tale from the Brothers Grimm. Finally, our Storyteller’s Corner folk tale will give you food for thought. It certainly gives the cheeky but quick-thinking protagonist food in her belly. The Clever Cook was originally collected by the Brothers Grimm and has been revised here for a younger readership. We can’t help admiring the naughty heroine. What do you think? We love the illustrations by Laura Wood. Furthermore, we’ve crammed in extra activities including drawing, origami, a maze, puzzles and our new book recommendations. You can win copies here. 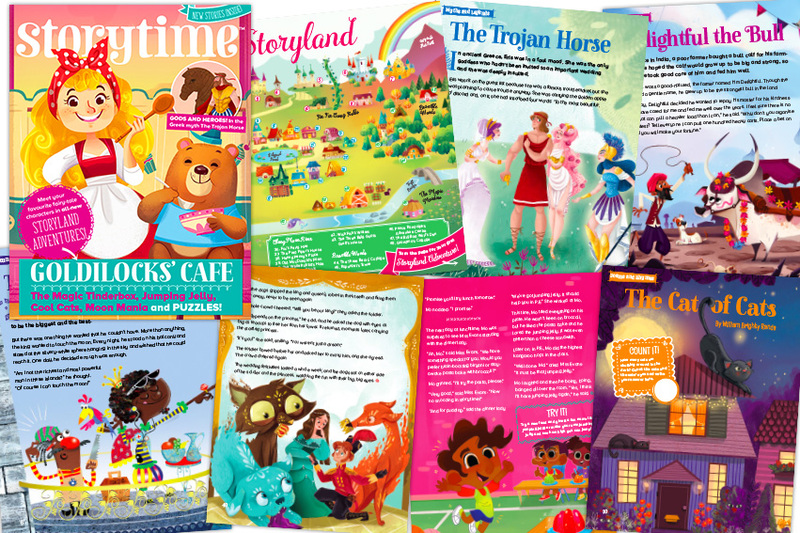 Over on Twitter, Facebook and Instagram, we’re asking our readers some questions about fairy tales to tie in with our new Storyland Adventures strand. We’d love to hear your thoughts on your favourite characters, locations and elements from the world of fairy tales, so let us know. We hope you enjoy the new story strand and wish you all the best with back to school. Have a great month and check back here for illustrator interviews, free downloads and more in coming weeks! 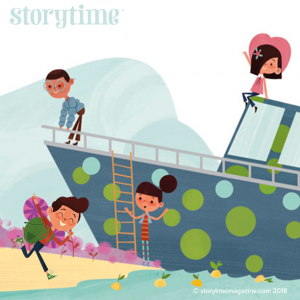 Storytime Issue 48 – Dive In! 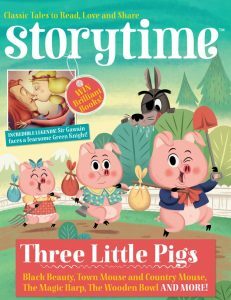 The summer holidays are well underway here in the UK, so we thought we’d celebrate summer with all-new Storytime Issue 48. In this exciting new issue, you can cool down by diving into the ocean with narwhals, catch the sun, share a shadow and even build a sandcastle. Plus there are many more wonderful stories, poems and activities inside. We’ve even got a narwhal game for you! 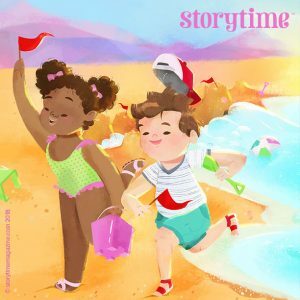 We hope you enjoy the super summery theme and that it helps keep your Storytime sessions alive over the holidays. It’s a subject we’ve touched on before, but away from school, many families let reading slide over summer and reading skills then regress by the start of the new term. The best way to ensure this doesn’t happen is to keep reading fun. Don’t turn it into a chore or a bore (“you can only go out and play after you’ve done some reading”), instead make it something to look forward to – a reward at the end of the day or for tidying a room. See 20 Great Places to Read this Summer for some ideas. Give reading positive associations and your children will want to do it all year round. 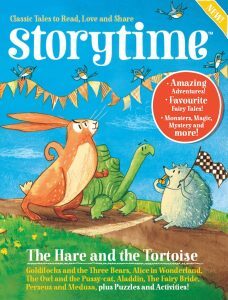 We think Storytime Issue 48 has just enough fun and adventure to keep them engaged and inspired. Who can resist a story about four little children sailing around the world? Here’s what’s inside our summer issue along with links to our highly valued and brilliant contributors. A poem about building sandcastles in Storytime Issue 48, illustrated by Fiona Dulieu. We open the issue with an ode to building sandcastles, gorgeously illustrated by Fiona Dulieu. If this doesn’t make you hanker after a trip to the beach with buckets and spades, then we don’t know what will. If you can’t get there, make a sandcastle card in our Storytime Playbox section instead. Things heat up in our myth from Polynesia and New Zealand, which follows demigod Maui as he decides to force the sun to slow down. Catching and taming the sun isn’t as easy as it looks, however. Our sizzling illustrations for this superhero story were created by Alberto Badalamenti. Edward Lear’s fabulous tale about four little children sailing around the world in Storytime Issue 48. 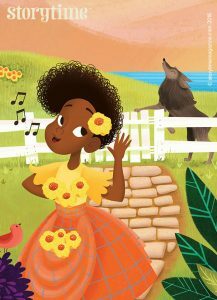 Illustrated by Alejandro Mesa. Our Favourite Fairy Tale in Storytime Issue 48 was penned by lord of the limerick, Edward Lear. It features Four Little Children Who Went Round the World, and is full of quirky details, weird creatures and perilous moments. It also comes with custard-loving mice and chocolate drops! 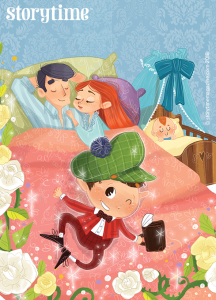 Kids will love the story and the illustrations too, which are by Alejandro Mesa. Soaring into the issue is our second poem, The Eagle by Alfred, Lord Tennyson. It’s a short poem, but it packs a lot of punch. It’s a mini masterclass in writing poetry and is often used in primary schools. Our illustration is by Stephanie Fizer-Coleman, who is the perfect fit. If you haven’t ogled her 100 Birds project yet, we highly recommend it! Melusine’s Mystery ‚Äì a folk tale in Storytime Issue 48, illustrated by Elena Iarussi. For Storyteller’s Corner, we bring you Melusine’s Mystery – a tale from Europe about a knight who falls in love with a mysterious woman, but she refuses to let him see her on a Saturday. Find out what she’s up to in the issue. We’re really happy that Elena Iarussi illustrated this story, who also did a beautiful job of our Estonian myth about the Milky Way in Storytime Issue 36. Finally, our fable travels to the Middle East for a journey across the searing hot desert. Sharing a Shadow has an obvious moral message and everyone gets their just desserts, but in a funny way. Illustrator Laura Proietti helped us bring this story to life with the perfect palette of colours. Who says you need to go away in summer? Stories have the power to take you anywhere and everywhere, and in Storytime Issue 48, we hope we’ve given you a trip to remember. If you’re still not sure and want to have a closer look at our latest magazine, you can flick through here. School subscribers get a special resource and activity pack to go with this issue, inspired by all the featured stories and poems. If you’d like to know more about this, visit our Storytime for Schools site. If you enjoy this issue, we hope you’ll love the next one even more. We’re launching a whole new series of exclusive stories, featuring all your favourite fairy-tale characters. Make sure you don’t miss it, subscribe today! In the meantime, send us pictures of your sandcastles – either real ones, junk-modelled cardboard creations or sandcastle cards. We’d love to see how creative you can get. Share them with us on Twitter, Facebook or Instagram! Happy holidays from the Storytime team! Last week, Storytime’s Guide to Magical Beings featured some of the smaller and harder-to-spot members of the magical world – brownies, fairies, pixies, boggarts and leprechauns. This week, Storytime’s Guide to Magical Beings Part 2 looks at some of the big hitters. Human-sized or greater, if you bump into one of these magical beings on your summer outings, make no mistake, you’ll know exactly who they are and what you’re dealing with. Jack’s evil nemesis in Storytime 5. Art by Brad Renner. 6. Giants – we never shy away from giants in Storytime. 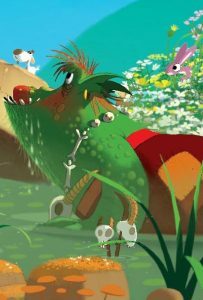 Jack and the Beanstalk stars in Issue 5, Jack the Giant Killer is in Issue 45, Rhitta the Giant is in Issue 43, and the fabulous Finn MacCool features in Issue 7. Plus, we have a whole posse of super-sized thugs in Issue 25‘s The Brave Little Tailor. Giants are gigantic magical beings and are found all over the world. They have immense strength and can uproot trees but, fortunately, where they have brawn, they lack brains. That said, not all giants are stupid and they don’t all like crunching the bones of Englishmen. Some giants are civilised, friendly and prefer to eat cattle and sheep. Apparently, Gogmagog was Britain’s last giant. He was thrown off the edge of a cliff while doing battle with the Trojan giant slayer, Corineus. Many believe that giants still exist, but think they went into hiding centuries ago. The best place to look for them is in large mountain ranges. However, you can see Molly Whuppie whooping a giant in a future Storytime issue! The world’s most famous troll in Storytime 10. Art by Dankerleroux. 7. Trolls – the troll you probably know best appears in The Three Billy Goats Gruff in Storytime Issue 10. We’ve also featured the The Bear and the Trolls in Issue 27 and, unusually, female trolls in Issue 2‘s East of the Sun and West of the Moon. It seems that trolls bear many similarities to giants. They even have a similar catchphrases: “I smell the blood of Christian men.” As a result, giants and trolls are widely believed to be close relatives. In fact, trolls might be descended from the race of giants from Norse mythology. Trolls are generally big, ugly, hairy and not very bright. They inhabit the remote forests, mountains and caves of Norway and surrounding areas. Trolls can be fearsome, but they have a weakness – exposure to sunlight turns them to stone. There are many interesting rock formations in Norway which are said to be trolls who once got caught in the sun. 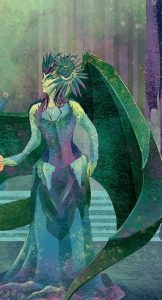 The Dragon Queen in human form, Storytime 36. Art by Alessandra Fusi. 8. Dragons – many dragons have graced the pages of Storytime. St George and the Dragon roared into Issue 2, the Chinese myth of The Four Dragons is in Issue 10, Kenneth Grahame’s The Reluctant Dragon starred in Issue 25, there’s an amazing Dragon Queen in Issue 36, and a fantastic Japanese Eight-Headed Dragon in Issue 46. Depending on where you live, dragons can be benevolent and helpful or princess-kidnapping, treasure-hoarding terrors. Some dragons are wingless or winged. Most dragons have one head, but they can have up to eight! Some breathe fire and others bring rain. However, one thing that every culture agrees on is that dragons are large, scaly serpent-like creatures with four legs. They live in caves, lakes, pools and mountain hideaways, and some live at sea. Incidentally, dragons are one of the wisest and most intelligent magical beings. Should you ever meet one, you can be sure of a good conversation. 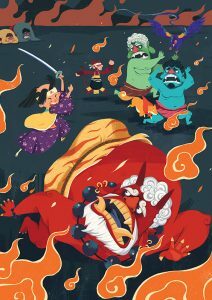 Momotaro faces Japanese ogres in Storytime 26. Art by Quang Phung Nguyen. 9. Ogres – you can find an ogre in Puss in Boots in Storytime Issue 14 and Japanese ogres feature in Momotaro the Peach Boy in Issue 26. Ogres are brutish beings. They are even uglier, hairier, clumsier and more foul-tempered than giants and trolls. They’re greedy and their favourite food is humans. They love nothing better than crunching bones between their teeth. Ogres are smaller than giants but larger than humans and they have an odd skin colour, tinged green or grey. Despite their stupidity, they often live in castles or grand mansions, which they’ve usually taken by force. That said, ogres can transform into any animal. Who’s going to argue with an ogre who can turn into a venomous snake or a deadly crocodile? 10. Genies – this powerful being starred in Aladdin and his Magic Lamp in Storytime Issue 1 and Aladdin and the Princess in Storytime Issue 40. 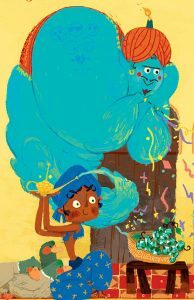 The genie makes Aladdin’s wishes come true in Storytime 40. Art by La Studio. Genies are magical beings from the Middle East, where they are better known as jinn or djinn. They are powerful spirits who spend much of their time hiding in dark and mysterious places – not just inside magic lamps. Genies can appear in many different forms, but look mostly wispy and almost smoke-like – as though you could put your hand through one. They’re also fond of bright colours, so don’t be surprised if the genie you meet is bright green or blue. Some genies are more powerful than others, and not all of them grant wishes. If you meet one of these, certainly choose your wishes with caution. Some genies twist your words to cause trouble. Which one would you like to meet? Or is this latest batch a bit too big and scary for you? If so, check out Storytime’s Guide to Magical Beings, Part 1 for smaller and more manageable supernatural sensations. 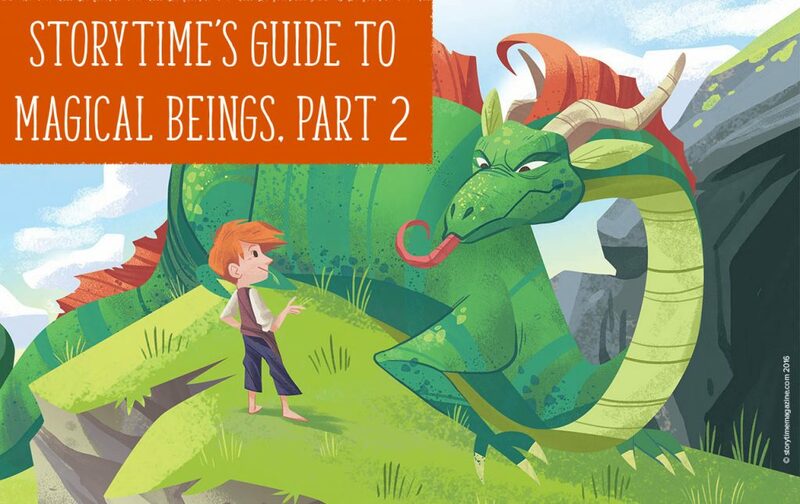 Has Storytime’s Guide to Magical Beings Part 2 inspired you to write a story or get outdoors and go on a troll or dragon hunt? Are there any giant folk tales in your area? What wish would you ask a genie to grant? Can you draw a picture of your favourite magical being so far? Finally, is there one we’ve missed? Share your thoughts and creativity with us over on Twitter, Facebook or Instagram. We’d love to hear from you. Ever woken up with your hair in knots? It might be the fairies! 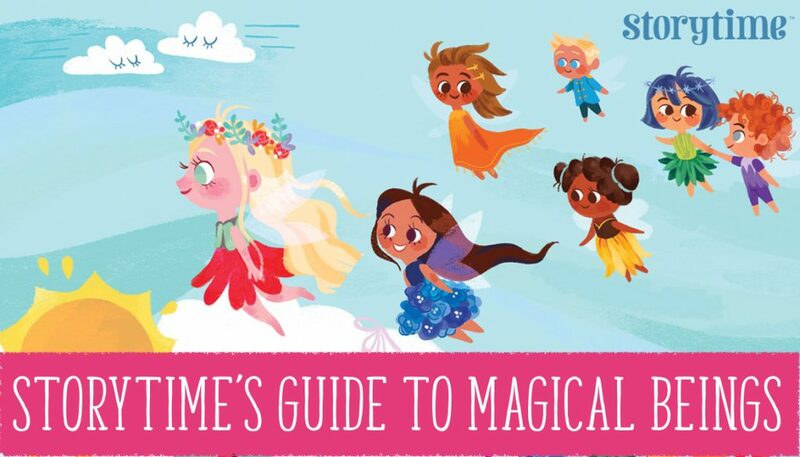 We’re so passionate about reading and improving literacy, we can talk about it until we’re blue in the face, but for a bit of fun and a lighter read, we thought we’d share part one of Storytime’s Guide to Magical Beings. We’re lucky to have such rich and fantastical folklore in Europe, featuring so many extraordinary and enchanted creatures and beings. But The Wee Brownie – a Scottish folk tale in Storytime Issue 47 – inspired us to write this particular blog. We realised that, though residents of Scotland might be familiar with brownies, many readers won’t have come across this unusual magical sprite. As a result, here’s a quick and easy guide to five of our favourites. See if you can spot them this summer and report back! The Wee Brownie in Storytime 47. Art by Sara Torretta. 1. 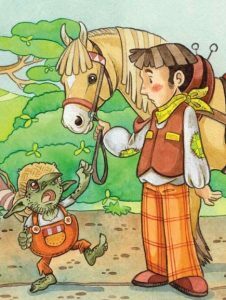 Brownies – one appears in Scottish folk tale, The Wee Brownie in Storytime 47. Brownies are rarely seen household helpers. They are short and old in appearance, and rather scruffy too. Brownies appear only when you’ve gone to bed because they delight in tidying up your mess. They mainly inhabit Scotland and northern England. If you love your brownie, never leave it a gift of money or clothes or they will leave your home forever. However, they’ll never refuse a bowl of creamy porridge, especially if it’s drizzled with honey. Brownies are a type of goblin and have different names in other cultures. For instance, in Scandinavia, they are known as tomte. It seems likely that Dobby the house elf from the Harry Potter book series was based on a brownie. 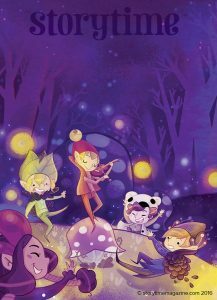 Pixies dancing in Storytime 23. Art by Astrid de Souris. 2. Pixies – a pyramid of these cheeky imps stars in Nancy and the Pixies in Storytime Issue 45, and The Laughing Pixie is an Arthurian folk tale in Storytime Issue 23. Known locally in Cornwall as ‘piskies’, these diminutive creatures are similar to elves. You can spot them on the moors of Devon, Somerset and Cornwall, where they live in secret places underground. They wear pointy hats and have pointed ears too. They are famous for being playful – often mischievous – and they love to dance, which they happily do all night. Hundreds of pixies often dance in large circles together. Surprisingly, they’re also keen on wrestling and horse riding. Bad-tempered pixies are called spriggans and you should avoid them at all costs. 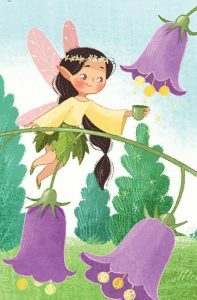 A fairy from Elidor and the Golden Ball in Storytime Issue 30. Art by Nina de Polonia. 3. 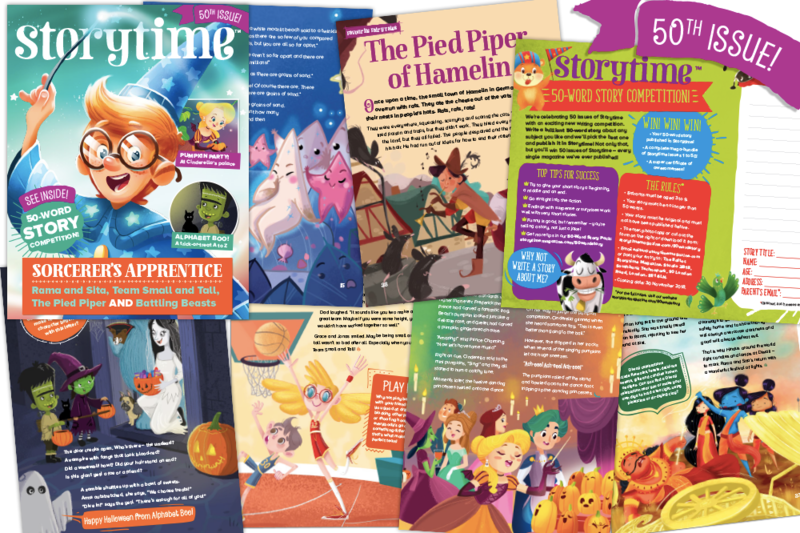 Fairies – You’ll find many fairies in Storytime, including The Legend of Knockgrafton in Issue 42, The Fairy Dog in Issue 39, Elidor and the Golden Ball in Issue 30 and Fairy Ointment in Issue 10. The fairies in our header appeared in Issue 35. (Art by Anoosha Syed). Fairies are one of the most famous magical creatures in European folklore, but seeing a fairy is extremely rare. Though fairies look human, they often have green eyes and can range in size from tiny to the size of a child. Not all fairies have wings. Fairies can be naughty. They like to lead travellers into their hidden realms or sneak into your room at night and tangle up your hair. If you wake up with knotted hair, you’ve probably been visited by a fairy. If this worries you, wear a protective charm. Try wearing your pyjamas inside out, for instance, or placing a piece of bread by your bedside. A grumpy boggart in Storytime 8. Art by Marga Biazzi. 4. Boggarts – The most notorious boggart of all featured in Storytime Issue 8 in The Farmer and the Boggart. Boggarts live mainly in England. Mostly, they make their homes in marshy bogs, hence their name. However, some boggarts live in houses. They especially like to live close to farms, where they do their best to cause chaos and steal crops. Without doubt, they are beastly little beings. They’re unpleasant to look at, scruffy, grumpy and always up to no good. If you spot a boggart, do your best to not to make eye contact with it or it will follow you around forever. Boggarts can also change shape and appear as wild animals. Never name a boggart or it will become truly wild and destructive, tearing up your home or fields. Scientist are yet to understand why. 5. 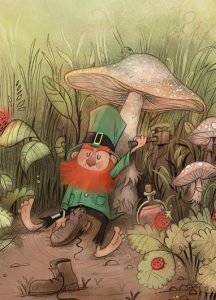 Leprechauns – For a funny and clever leprechaun story, read Jack and the Leprechaun in Storytime Issue 31. Many people forget that these funny little men, often shown with red beards, are actually a type of fairy. Leprechauns are found throughout Ireland. They can be friendly or they can be fiendish tricksters, depending on how you treat them and what mood they’re in. They’re talented shoemakers and often keep a stash of gold in a secret underground burrow, which you can claim, but only if you’re clever enough. If you catch a leprechaun, he might grant you three wishes – but he’ll probably do his best to trick you first. We hope you’ve enjoyed this first instalment of Storytime’s Guide to Magical Beings. You might welcome some of these characters into your home quite readily, but you’d better steer clear of spriggans and boggarts! 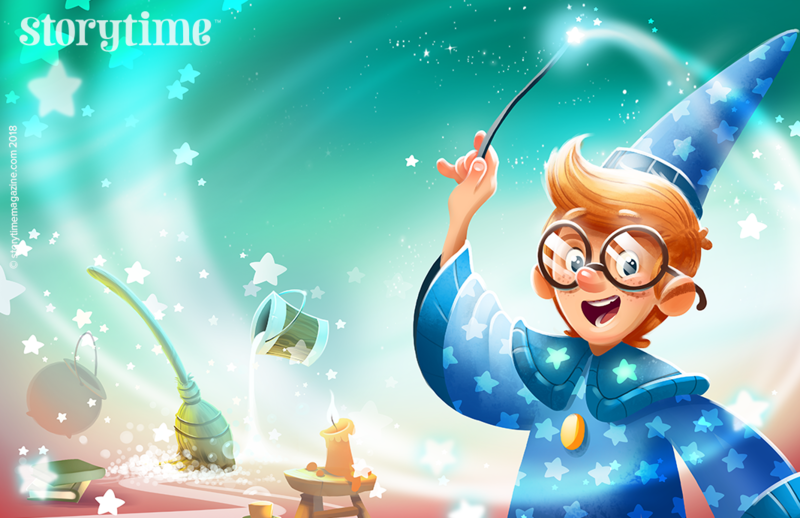 Don’t worry if you don’t spot any magical beings – you can always find them in the pages of Storytime. On the other hand, if you do encounter any of the creatures above, we’d love to hear your stories. You can always contact us via Twitter, Facebook or Instagram. Until next time, we’re away with the fairies!